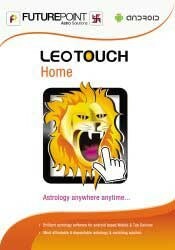 LeoTouch Home Edition is the most affordable & dependable astrology & matching solution available today for astrologers. Comprehensive astrological calculations - includes Avakhada, Ghatchakra, Tara Chakra, Panchang Calendar. The modules that one gets in LeoTouch home package are Astrology, Matching & Tables. This package also contains fundamental astrological calculations and tables. Various tables which are required in astrological studies are included in it. Specially designed for astrologer & astrology students who want to make horoscope for consultation or study purpose. It is also good for family who wish to cast horoscope for their family members or match horoscope of their children for marriage. It gives you real value of money, contains astrological calculation up to fifth level, number of books on astrology, Vastu, Palmistry and Numerology, 21 system of Horary to get instant answer to your query without feeding birth details. The modules that one gets in LeoTouch home package are Astrology, Matching & Tables. The principles of horoscope matching have been incorporated in LeoTouch after the comprehensive and thorough studies of these principles. Contains data of 1000000 cities. Besides above, the LeoTouch Home Edition contains many mantras that can be heard in proper pronunciation. An interesting feature is inclusion of various Horary Tools such as Tarot Cards, Gautam Kevli Mahavidya, Ram Shalaka etc. The Bio-rhythm Chart is a useful feature for knowing the ups and downs of Health, Finance and Emotions. A useful aspect is incorporation of various books of astrology that are fit for regular consultation.